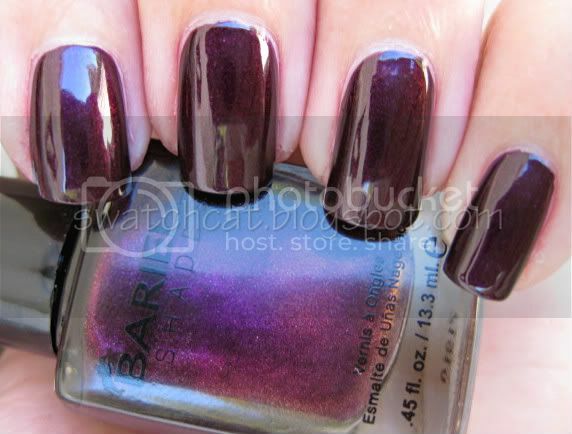 Here is the second half of my Barielle polish order. I really love all the colors I picked out, and with the exception of one, the online color representations are fairly accurate. Misbehaving Mistress is a deep, metallic tapue or dirty, metallic charcoal. In some lights it is more silvery-charcoal, and in others, the taupe base shows through. Either way, it's a really interesting color. It's in line with the taupe trend, but the metallic finish makes it stand out. Plus, I really like that it applies non-streaky. Hidden Hideaway is a metallic raisin color. This one was the interloper...see how pretty?! It's not as metallic as Misbehaving Mistress, but it still falls in that category. Indoors, it is nearly black. Outdoors, the slightly brown base is more evident, and in the sunlight the fuchsia shimmer really glows, giving it a lit-from-within look. Blackened Bleu really lives up to it's name, as it is a sheer, black base chockful of sapphire blue glitter flakies. I'm pretty sure I've mentioned before that I'm not a blue fanatic, but this one is drop-dead gorgeous. Indoor, it's a pretty navy sparkle, but out in the sunlight, that blue shimmer just glows! I'm shocked how much I love this color. 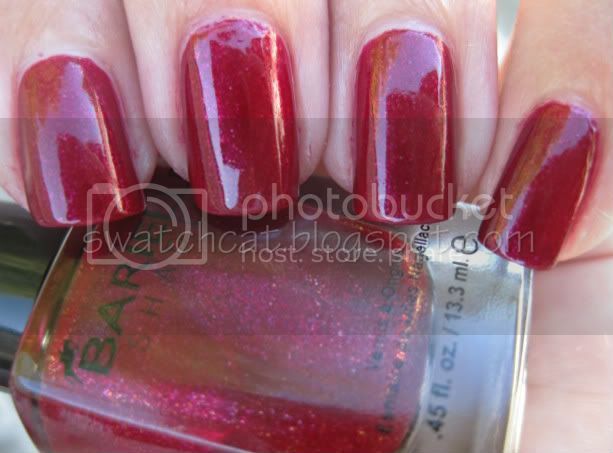 Glammed-Out Garnet has a sheer red base and is loaded with iridescent magenta flakies. This polish is basically the red sister to Blackened Bleu, except the sparkles are iridescent. You can see the lilac flash in the bottle and on the nails, too. You might also detect a gold flash, but that kinda disappears. It's the magenta and lilac flash that are most evident. 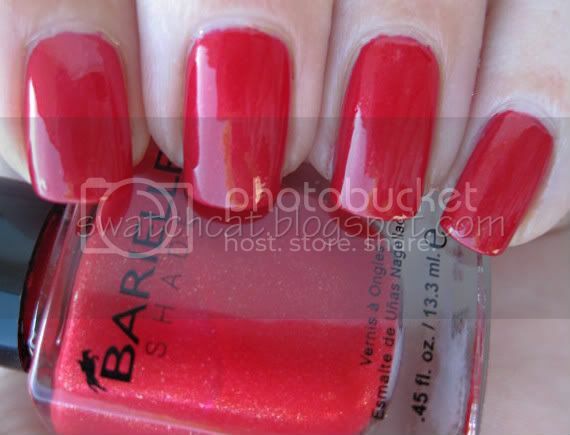 This is a really pretty polish, and a nice alternative the the plain ol' red. It would make for a great holiday mani, too. This, and the one above were four coaters. Pin Up pretty much describes itself. A creamy tomato red with pink shimmer that just screams 40's screen star. You can see there are gold flakies, but they just disappear. A bit of a shame, as I think the gold flakies would add just another pretty dimension to this polish. Find Barielle online (buy two, get one going on right now!) and a small selection available in-store at Ulta. Beautiful! I love the red! I am following your blog from Specktra.net feel free to follow me back! Hehe, I am the same way, Saadeh! I am loving the reds, too, Aprill. I just changed my polish to Essie's Limited Addiction from the fall collection. I'll have a swatch of that one up next week!